It felt like a one man show at the theatre than a movie. For those who have heard of Locke, can you tell us what is it all about? Stephen Knight: It’s about one man. I made the decision to point the camera at an ordinary man. He’s not Jason Bourne, he’s not James Bond. He works in construction but he made a mistake. This is the story of the night that he tries to make amends, that he tries to put things right. It’s the story of the journey of a man on principle who decides to tell the truth. I Heard that you got Tom Hardy to sign onboard even before you wrote the script. Yeah, the idea was to make a more conventional film before this and part of that process was shooting from a moving vehicle on a motorway in the city. We did test footage, testing the camera. And I found the images really beautiful and hypnotic and I thought well maybe you could make that into theatre. Put an actor into that space and shoot a stage play as a piece of cinema. I had the character, the idea and the story already and I was meeting Tom about something else. The conversation got on to this idea and he was really keen. I wrote it sort of knowing that he would do it and the whole process was really quick. We met in November and started shooting in February. I understand that the film was shot in real time. Was it an easy process to do? It makes life easier in a way because we decided to approach the whole process of making the film in quite of a naïve way. We put three cameras into the car. I would say action once and we shoot the whole thing from beginning to end, take a break, and then shoot it again. We ended up with sixteen versions or sixteen movies effectively. I took it to the editing room and cut it together. It presents problems but it also means that you don’t keep going back and doing takes. You don’t redo anything. You just let it go because you know it’s going to be good in different places and bad in different places every time you do it. You know that was the way of making this film. We have the other talents of Olivia Colman and Ruth Wilson. How did you get them to sign onboard? Were you looking for a particular voice for the characters since all we hear are their voices through the car’s speakers? Basically, we went for the best actors in the UK and amazingly, all our first choices said yes which is very unusual. They were signing up to not appear onscreen, they were just going to be voices and they knew that. They were intrigued by the project and the process. It was quite a short shooting period. So, it doesn’t mean that someone has to give you eight weeks of their life, they just have to give you one week. They did a fantastic job. Were all the voice actors at the same different location? We put they all in a conference room at a hotel, not as big as this one, with some red wine and some biscuits. Then, we opened a phone line to the car. I was on the low loader with Tom as he was in the vehicle. I would cue them in sequence and they would make their calls according to the script. Then, they would take a break and we’ll do it again. So, they were in the conference room from 9:00am to 4:00pm. I’ve noticed in the film that Locke was coughing and sneezing throughout the film. Was that improvised for the film or was it a real cold that Tom was fighting? He actually had a cold. All the way through this process we wanted to embrace something as it happens and welcome these “happy accidents”. ON the day we started shooting, he had a bad cold and was taking medicine. So rather than put make-up on his nose and dry him up, we went with it and say that he has a cold. The next major character of Locke is the car, in this case, it was a BMW. I heard that you wanted to use a Land Rover and the moment you pitched it to the car companies…. They didn’t quite understand what we were going to do. You can understand that because it was quite an odd concept when its on the page until you see it. So, we didn’t get the Land Rover that we wanted. So, BMW gave us two cars for two weeks. Now, they are very interested in the concept and very friendly to us. You see a lot of that car. Did you happened to close the roadway in order to film or did you film “Locke” in real time as it happens? All the traffic is real. There is no road closures at all. It’s good because things happen when you traveling and you’re driving. Anything that was happening and was useful, we kept in. The police driving by was great. At one point, a van or a truck pulls into the shot and you can read “It’s Always Be” and that came from nowhere. Where did you get the idea of Tom having multiple conversations in his car? Locke is an ordinary man being put the most extraordinary circumstances. He’s trying to be there for the birth of his new child from a woman who slept with one time. He’s trying to save his job and his marriage all within two hours. That’s impossible for a normal person to deal with in such a small time frame. It’s sort of heroic in an ordinary way. I’m interested in the way that technology and cell phones are available to all aspects of our lives all the time. All of us do a master class of acting everyday where the phone rang and you look at who’s calling and you become a different person according to who’s phoning. You become the parent, the boss, the employee, the partner. They are all different people effectively. Just trained a camera on someone as they are crunching those gears and changing and doing all those different things, being to a moment of extreme duress. I feel it’s interesting and yet recognizable. When people see the film, they come to me afterwards and say that’s a journey I recognize and it’s a situation I been in – in terms of a crisis where you have to deal with so many different things at the same time. This is your sophomore film as a writer/director. Which do you prefer the most: writing or directing or both? The process of writing I prefer because you are in control of it more. You are not at the behest of other people. Directing, I feel its something I have to do because when you write a film, the film is in your head and you see it. When you direct, you try to get as close to the film as you possibly can. If you hand it over to someone else, it could be better or could be worse but it will be different. If you do it yourself, it will be up to you to make the film in your head appear on the screen. What is the overall message you hope people would take away from “Locke”? What’s been great about the response is that people forget it’s a movie made in a different way and engage with the characters in the story. They asked the question “Did he do the right thing?” All of people sort of understand that he’s got principles and tries to do the right thing but is the consequence worth it. If he told a couple of small lies, maybe fewer people would have been hurt but he would have been lying. I hope it leads people to questions rather than answers. 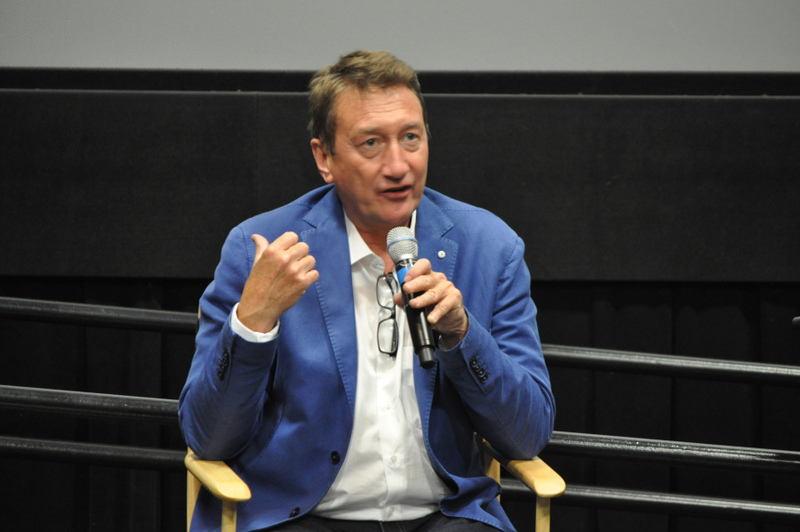 Thank you Steven Knight! Be sure to watch “Locke” as it hits the big screen TODAY!